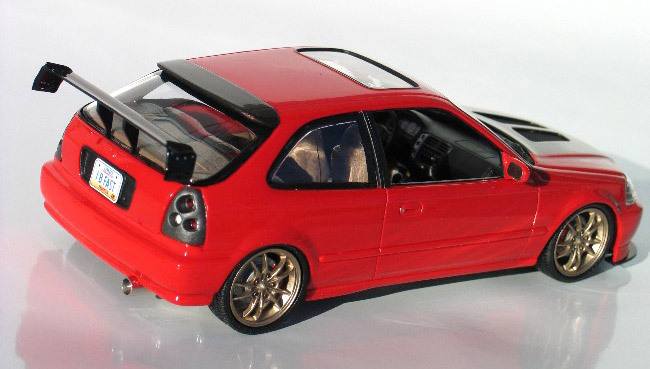 I have secretly been an import and tuner car fan for years, but haven't gotten around to building any models of them. 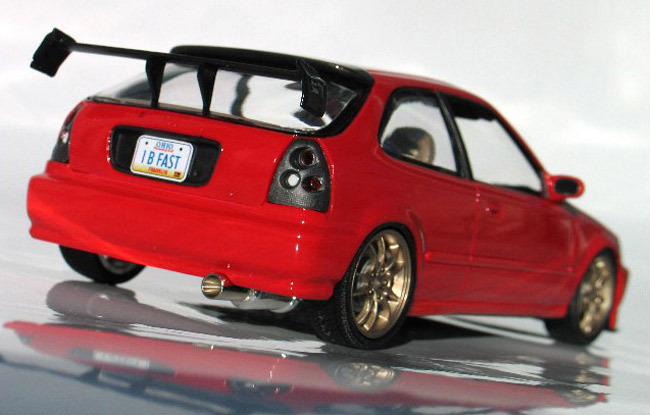 Recently, I picked up a few of the Revell Honda tuner kits and decided to give them a shot. These are very nice kits with lots of optional parts. Here is the first one that I have completed. It's a mildly customized '99 Civic. At least I am guessing it's a '99. I am not a Honda expert, and I think these cars changed very little from '96 thru '00. First the body mods. Although the kit comes with an aftermarket body kit, I wanted to give mine a different look. Using the stock front fascia, I opened up all the front grill and driving light openings. Then I re contoured the face and extended the air dam downward to look more aggressive. I also made a front splitter from sheet plastic and struts were made from stainless steel guitar string. For the hood, I ground open two large vent holes and then covered the openings with a fine wire mesh painted black. You can't make a tuner car without putting a humongous wing on the back, so I dug through my scrap parts box and found one from a Tamiya Alfa Romeo touring car kit. I had read some good reviews of the Tamiya spray paints and thought this might be a good project to try them out on. 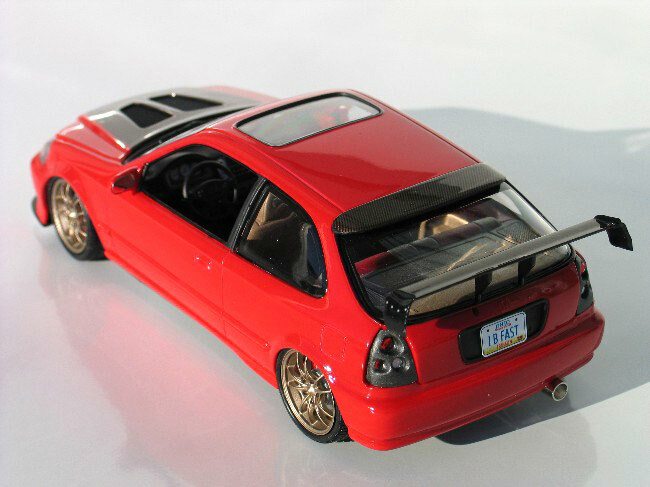 The body was painted with Tamiya gloss red shot straight from the rattle can. Normally, I like to spray paint a little on the heavy side so that it will flow out into a nice smooth glossy surface. I found this paint to be very thin and flow out extremely well so, four light coats worked better than one or two heavy ones. After the paint had dried for a couple of days, I applied Microscale carbon fiber decals to the splitter, hood, rear window spoiler and the rear wing. Finally the carbon fiber parts with covered with a coat of Dupont urethane ultra clear to look more realistic. Even though this Revell kit came with a bunch of wheel options, I wanted to further set mine apart. The wheels I chose were the optional rims that come in the Tamiya Honda S-2000 kit. Other details include a custom license plate which I made myself and scale carpeting in the interior. I also modified the suspension so the car would sit a little lower. The rest of this model was built straight from the box.